If nature has denied you the physical strength, it has certainly provided you with the greatest intellectual powers, by which, fitly trained in the study of literature and science, a far more genuine and brilliant glory is achieved. If you do this, as I hope, you will realise, believe me, that the weapons of Pallas are no less conducive to fame and distinction, than the weapons of Mars. The last sentence of this letter thus introduces a distinction between the weapons of Minerva and those of Mars. In the first part of Feliciano’s manuscript, Hercules at the Crossroads stages the arms of Minerva, or wisdom, in the form of Hercules’ famous club. The second part, listing military terms, corresponds to the goal of knowing the weapons of Mars. The illustration, presenting a warrior in arms, is quite explicit, as is the inscription Mars Victor (victorious Mars) placed above the image. The mention of Orion, underneath, conveys the same idea: In ancient mythology, Orion was a giant hunter. He is often identified as Ensifer, meaning “sword-bearing,” which corresponds perfectly with Feliciano’s warrior brandishing his sword. The cavalier in the miniature was transposed, as we have seen, as the Cavalier of Swords in the Tarot of Marseille (see episode 14). Could the Sword suit be emblematic of the arms of Mars? In that case, this series of 14 cards (Ace to 10, then Knave, Knight, Queen, and King) might illustrate different variations (degrees or qualities) relative to the martial domain – violence, conflict, and warfare. The drawing of the Ace of Swords seems to confirm that hypothesis. It represents a hand brandishing a red (the color of Mars) sword, which is topped by a crown into which a palm and a laurel bough – traditional attributes of victory – are inserted. This card can be read literally in the light of Feliciano’s manuscript: He who masters the weapons of Mars wins victory and its prizes. 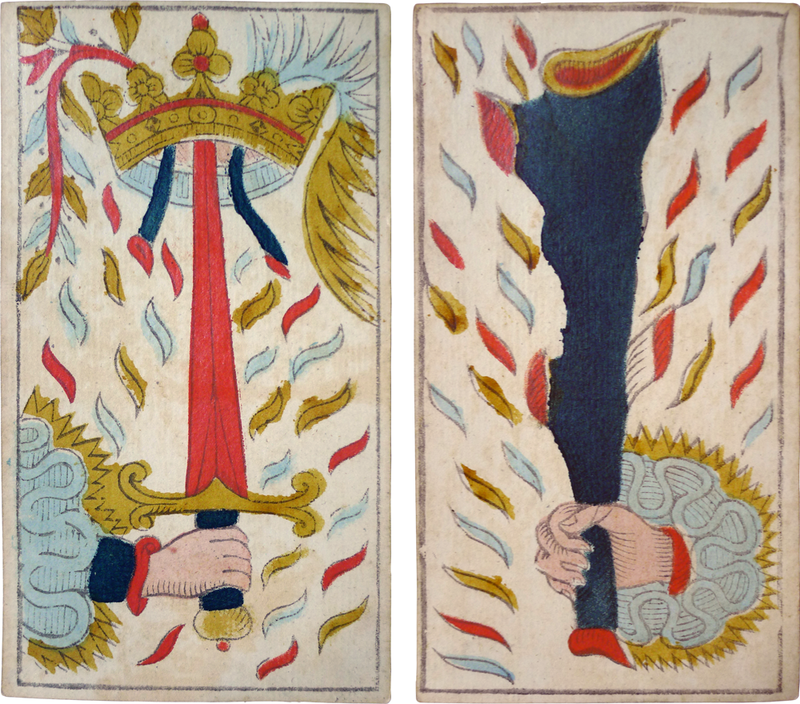 Nicolas Conver, Ace of Swords (left) and Ace of Clubs (right), 1760. The other miniature of the manuscript, Hercules at the Crossroads, also shows a hero, likewise armed — not with a sword, but with a club. If we follow Sassuolo da Prato’s dedication that distinguishes two types of weapons, this club could well represent the weapons of Minerva. 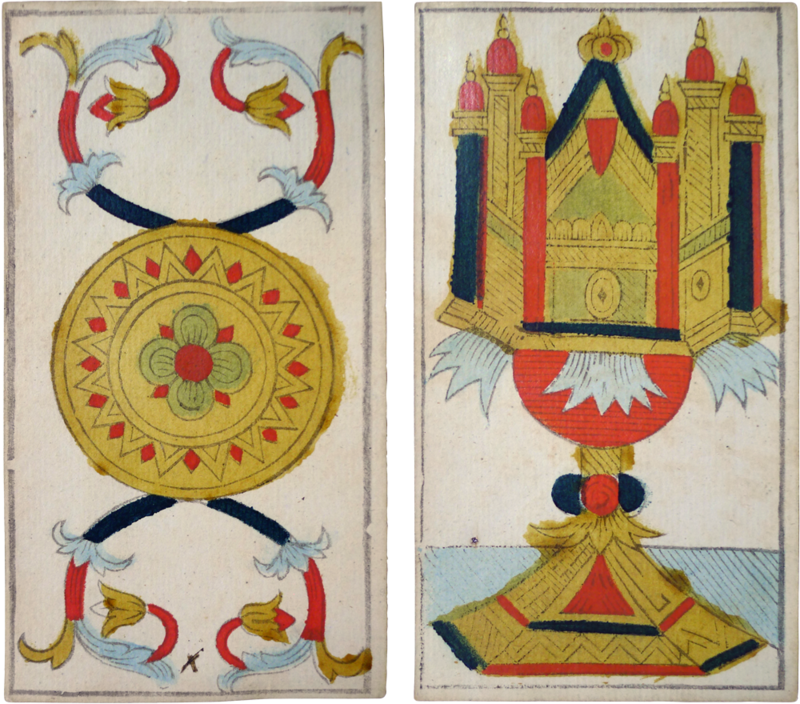 In that case, the series of Clubs in the Tarot of Marseille might represent different variations on the idea of wisdom. The Ace of Clubs is coherent with this proposition: a hand (human action) brandishes a weapon, this time a club. No reward appears here, maybe because the prize of wisdom is none other than wisdom itself. As regards the two remaining suits of the Tarot of Marseille, Cups and Coins, the realities they represent seem to have a nature other than Swords and Clubs. Indeed, the absence of a hand in the Aces of Cups and Coins seems to indicate, by contrast, that these suits have nothing to do with forces or human actions. At this stage, one can only conjecture that they could represent the values rejected by Hercules, but that were ardently desired by Philebus: material goods and pleasures. Nicolas Conver, Ace of Coins (left) and Ace of Cups (right), 1760. A text written in 1490 seems to validate this hypothesis. The author is the physician-philosopher Galeotto Marzio (circa 1424 – circa 1495). His wandering life brought him, on many occasions, close to some of the individuals who appear to be involved in the making of the Tarot of Marseille. Born a few years before Ficino and dying shortly before him, he was, as Ficino, a friend of the Hungarian Janus Pannonius (see episode 9). Like Felice Feliciano, he was also a friend of the painter Andrea Mantegna. In 1490, seeking Lorenzo de’ Medici’s patronage, he dedicated to him his De doctrina promiscua, a treatise on the science and culture of his time. But some might jeer at seeing the invention of such game being attributed to learned men, if reason did not show that the game, which we commonly call game of cards, was invented by wise men. Indeed, if I leave aside the powers of Kings, Queens, Cavaliers and Knaves (because anybody can see the difference of dignity and bravery), when we consider the powers of Swords, Clubs, Cups, and Peasant Breads, do we not recognize that the inventor was a man of subtle intelligence? Because where forces are in action, as with Clubs and Swords, the greater number wins over the smaller; but for the food and drinks, as we see for bread and wine, the smaller number wins over the greater. Because it is clear that those who are sober are of finer spirit than the gluttons and greedy, and will be superior when conducting their business. I give the Peasant Breads that name because of their shape and color, because Pliny says that the Ancients were accustomed to make them of yellow color; the Cups because they are chalices or goblets in which to drink wine; and what the common people thinks to be Coins are breads; finally, the Clubs, as the common people say. At first, this text may seem obscure. Marzio is committed to showing that the game of cards was invented by a wise man. He looks for clues in the rules of the game. He first stresses not to take into account the order of the court cards, the difference of powers between them being obvious in his eyes. In the rules of tarot, indeed, the King wins over the Queen, who beats the Cavalier, who, in his turn, outdoes the Knave. There is no need for prodigious knowledge to invent such a sequence. Marzio then focuses on the suit cards, from Ace to 10. According to the traditional rules of tarot, in the suits of Swords and Clubs, the highest number beats the smallest. For example, a 9 of Swords would beat a 7 of Swords. On the contrary, in the suits of Cups and Coins, the order is reversed: the smallest number beats the highest, so a 2 of Cups would beat a 5 of Cups. Marzio sees in this the mark of the game inventor’s intelligence. According to him, the Swords and Clubs represent “forces in action,” and the more you have of it, the better. Conversely, the Cups and Coins represent the “food and drinks,” domains in which moderation is advantageous. Marzio here agrees with this idea that Swords and Clubs represent forces, while Cups and Coins represent material goods. Whatever the interpretation of the tarot’s suits, this text demonstrates that in 1490, in the intellectual circles that gravitated around Lorenzo de’ Medici, card games were not considered mere amusements, but embedded a deep meaning — a testament to their inventor’s wisdom. On Feliciano’s manuscript, see Giorgio Montecchi, Lo spazio del testo scritto, in Agostino Contò and Leonardo Quaquarelli (eds. ), L’antiquario Felice Feliciano Veronese. Tra epigrafia antica, letteratura e arti del libro, Padova, Antenore, 1995, p. 273-274; Ioannis Deligiannis, The Latin Translation of Prodicus’s Tale of Herculis from Xenophon’s Memorabilia by Sassolo da Prato, “Studi Medievali e Humanistici”, X (2012), pp. 131-210, especially pp. 155-171. Letter edited and translated as an appendix to Ioannis Deligiannis, The Study and Reception of Plato at the School of Vittorino da Feltre as revealed from two epistles of Sassolo da Prato, “Humanistica”, VIII.1 (2013), pp. 128-129. Most probably the game of tarot. Indeed, as noted by Michael Dummet, the presence of a Cavalier among the court cards is characteristic of the game of tarot. See Michael Dummett, Twelve Tarot Games, London, Duckworth, 1980, p. 4. See Michael Dummett, Twelve Tarot Games, London, Duckworth, cit., p. 11-12.